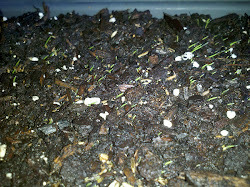 I'm growing Jonathan Green Black Beauty grass seed in a container as a little experiment to get a better feel for it to see if it's a grass I'd like to plant when I do a lawn renovation. 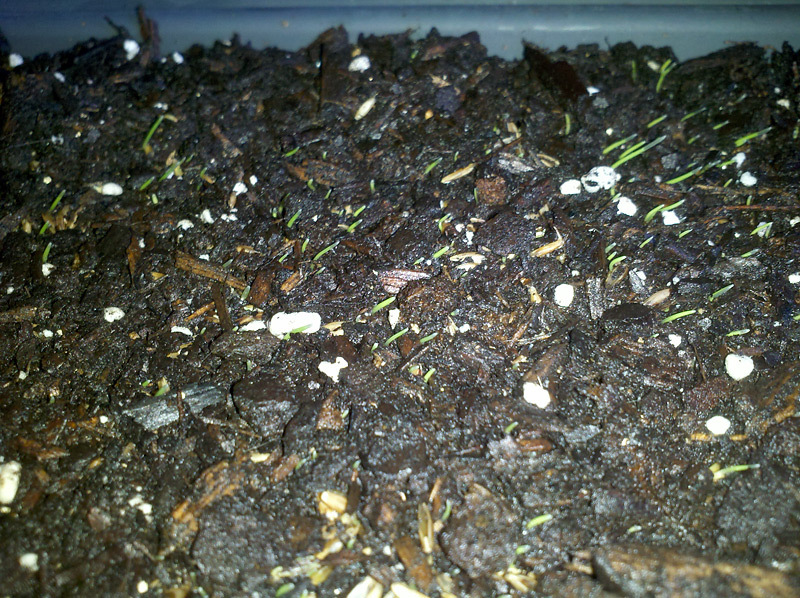 It's been 4 days since I planted the Black Beauty grass seed in an organic potting mix. I'm planting it in a container so I can better monitor and maintain it. 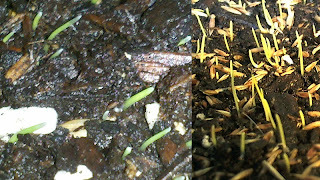 Yesterday I started to see signs that germination had started but today is the first I'm seeing little green shoots of grass emerging from the soil. So far it looks like I'm getting pretty even coverage. 4 days is pretty quick for this type of grass to germinate but since it's sitting on my desk I'm able to closely monitor the soil moisture and add water when necessary. One major difference I see compared to the germination of Dense Shade mix is that the blades of Black Beauty that are emerging are already leaning towards the sunlight coming through the windows. The Dense Shade on the other hand came straight up. One small section of the container is shaded by an obstruction and in that area the grass is coming straight up. I'm not sure if there's any significance to this observation but I wonder if the leaning grass shoots means Black Beauty wants more sunlight than Dense Shade?